^ Sydkoreansk skibsforlis: Dykkere pumper luft i skroget - Jyllandsposten 18. april 2014. ^ Death toll rises to 281 in South Korea ferry tragedy Asian Correspondent 14. maj 2014. ^ Sudden cargo shift emerges as possible cause - The Korea Times 17. april 2014. ^ Færgetragedie i Sydkorea: Tredjestyrmand var ved roret - Jyllandsposten 18. april 2014. ^ Eftersøgning fortsætter: 25 lig fundet - Jyllandsposten 17. april 2014. 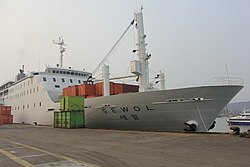 ^ South Korean shipwreck survivors: Passengers told 'don't move' as ship sank - CNN 17. april 2014. ^ Kaptajn fra Sydkoreas færgekatastrofe bliver anholdt - Jyllandsposten 18. april 2014. ^ "Millionæren uden ansigt" granskes efter skibsforlis - Jyllandsposten 24. april 2014. ^ 'Salvation sect' suspected of backing Yoo's business - The Korea Times 25. april 2014. ^ South Korea Ferry Probe: Cargo Was Three Times Recommended Maximum - Wall Street Journal 23. april 2014. ^ Ferry operator is raided by teams - Korea JoongAng Daily 24. april 2014. ^ South Korea ferry disaster: third mate 'steering in tricky waters for first time' - The Guardian 19. april 2014. ^ Acts of bravery emerge from pilloried ship crew - Associated Press 22. april 2014. M/S Sewol (+2014) - wrecksite.eu 18. april 2014. Denne side blev senest ændret den 26. april 2017 kl. 10:11.